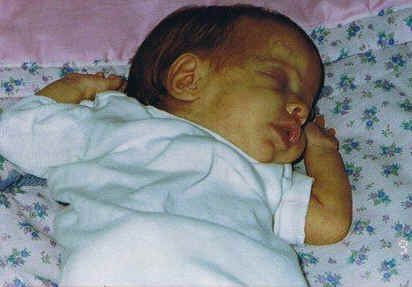 In our July edition of our Preemie Family newsletter we learned about Rachael Johnston, a former 25-weeker born in 1991. Rachael is a testament to preemies overcoming obstacles and doing well. Read more in an update by her mother, Lisa Olson. Rachael’s eyes were not open when she was born, so she was like a newborn kitten. It was cool to see her eyes for the first time. During Rachael’s first couple of days, she was very sick and had a 50/50 chance of survival. She was having a hard time going to the bathroom. When I saw her go to the bathroom, I knew things were working! Moving over to the the other side of the NICU – from the intense survival side to the feed and grow side!Getting off the Oxygen, and holding her like a normal baby was an amazing step, we were finally going down a path of relationship building and the harsh edge of survival living was beginning to fade. We were in the clear, and had a long term plan. The emotions were kept in check for about 6 weeks, and everything was very logical, and in a wait and see mode. Coming to the NICU, everyday you didn’t know what to expect, there were a million different things happening. To finally reach a point where we could rest, and breathe was very refreshing. What a relief! I was then able to take her out of the incubator, breastfeed, and do kangaroo care without assistance was outstanding. This became a twice a day occurrence for the month. And then we were able to take her home! There was one day, when Rachael was having a “Bad Day”, she needed to be bagged and she had an IV in her head. I thought to myself, this child is going to die! Now what? The nurse looked at me and said, “Remember YOU ARE THE PARENT, you get to choose, the rest of us are just high tech babysitters. You feel overwhelmed, confused, sad, helpless, hopeless, useless, and emotionally drained from the current events.” To have someone recognized that you are feeling this way and it is completely normal by someone who you think is in charge is a very powerful moment. You realized that you are taking care of this little bitty baby the best you can, and it gives you energy to carry on. So I did. Rachael, has done amazing well. Her Pediatrician would comment as she was growing up, that she has escaped many difficulties, and has come out of this situation unscathed. She is going to be a Junior at George Washington University studying Exercise Science and is on the Women’s Swim Team. At one point she would like to attend a PA School. She volunteers at Children’s Hospital in Minneapolis, and Waconia Hospitals.